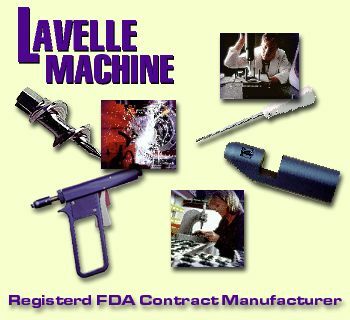 FDA REGISTERED For more than 10 years, Lavelle Machine has been manufacturing and assembling components for the medical industry. Customers. Our goal is to provide our customers with the most conscientious service possible, and to deliver every project on time. Quality. Every day, we endeavor to design and manufacture the perfect part, continually monitoring ourselves to ensure top product quality. Employees. Our mandate is to treat our employees with respect and utmost fairness, and to foster a complete team approach toward satisfying our customers goals and needs. Lavelle Machine has been presented "Supplier of the Year 1998" award from Smith & Nephew Endoscopy.